Do you like the idea of going to see a bunch of bands in one easy location, but tired of the high ticket prices, redundant reunions, obnoxious sponsors, or the general douchebaggery that summer festivals have become a refuge for? Can’t someone just put together a great bill for one low price without the looming specter of high-fiving “greeters” or underbutts? Well folks, we’ve answered the call. We’ve teamed up with Exploding in Sound to bring you some of our favorite bands in one easy, 100% all ages, outdoor location. There will be two stages of artists, food, drinks, friends, and it’s all going down for only $10, which you can purchase in advance with absolutely no processing fee. 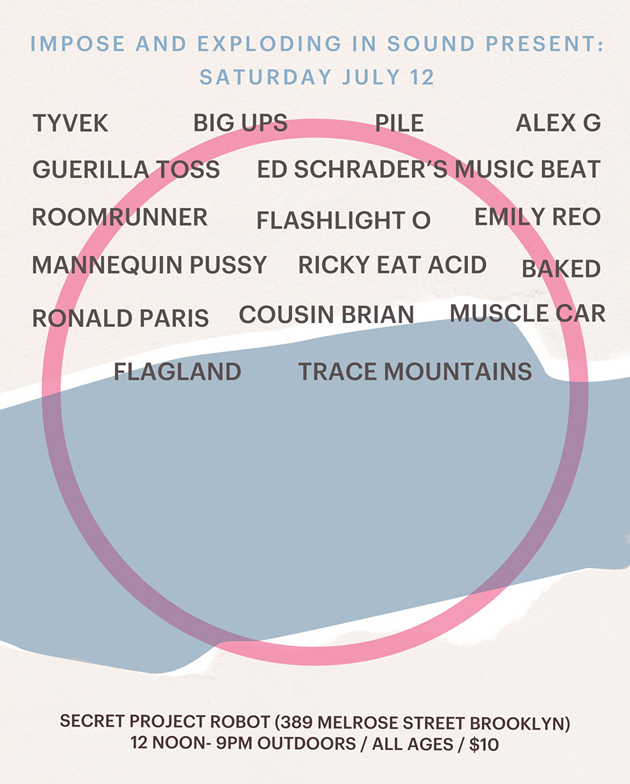 No bells, no whistles (unless literal), just your normal, basic all-day summer festival. See? That wasn’t so hard now, was it?